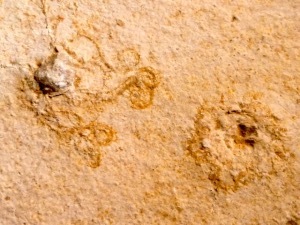 On this matrix is two specimens, of which are a Brittlestar (ophiuroid) and Sea Lilies (crinoid). Brittlestar are Echinoderms in the class Ophiuroidea closely related to the Starfish. They crawl across the sea floor using their flexible arms for locomotion. The ophiuroids generally have five long, slender, whip-like arms which may reach up to 60 cm (24 in) in length on the largest specimens. 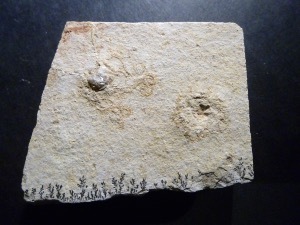 Crinoids, popularly know as Sea Lilies, posses a massive calcite skeleton, and were so abundant in the Palaeozoic (era) seas that their remains formed vast thicknesses of limestone. Most Crinoids are attached to the sea bed by a flexible stem, circular or pentagonal in sections, and made up of numerous disc like plates called columnals. At the top of the stem is a swollen cup or calyx (head) to which the arms are attached. The arms are used to filter food from the water. Soon after death, the entire skeleton normally falls apart into the small, separate plates called ossicles.